Inder Loves Folk Art: Thrift Store Skirt: Before and After. Thrift Store Skirt: Before and After. Remember that skirt that I got last weekend in my giant thrift haul? Pros: It's a deep teal, nubbly raw silk. The fabric is gorgeous. The fit is perfect. I love the style of the waistband and tie. It even has pockets! Cons: The length makes me look like a Duggar (with all respect to the Duggars, of course; they are a lovely family). The fact that I'm barefoot in that photo is not helping. Chop four inches off,* of course! 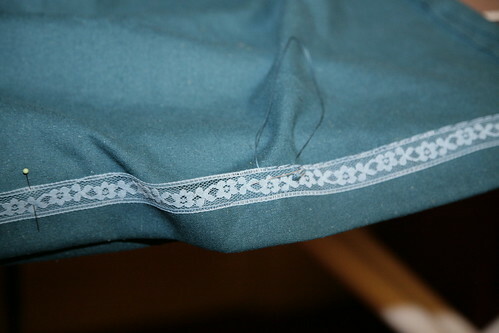 It's so easy to hem a skirt, I'm embarassed to admit, I rarely bother to do it. Hand-sewing seems so tedious, until you're parked in front of some bad television. Then it passes by in a flash! * This skirt would actually be more "on-trend" at an even shorter length, but I prefer my skirts to be knee-length, for comfort, modesty, and flattery. I guess I have more Duggar in me than I thought! It's fantastic! And even over here in Australia I have heard of the Duggars... they probably wouldn't have noticed one more slip in amongst them, would they? What a great find, and super kudos to you for seeing the potential in the skirt and then actually ACTING on your inspiration. You are inspiring me to have some things hemmed. No, not hem them myself. But actually take them to the very nice seamstress person in my neighborhood. As you know, I am a not-tall person, and I also prefer my skirts at the knee. Anyway, great work here. You look fantastic in this. I'm a big fan of giving hemming over to the local drycleaner's/alteration place. I did this one myself, but for suits, lined skirts, etc., they do a better job of it ... for only $8 or something. It's a good deal. Seriously cute and I love the color. What a score. I think the skirt is simply beautiful on you! That is an amazing find. 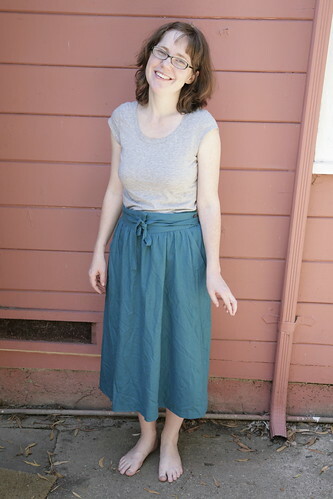 What a gorgeous skirt...especially at the new, "non-Duggar" length! longer (duggar length) skirts are totally coming back, according to some magazine i read. i actually think it's cute at that length too, but of course i like the short one better. I do like "tea length" skirts ... with very high heels. Which just isn't as practical for me. Otherwise, that length just screams "frump" to me, but also, I'm quite petite and short-legged, so maybe that changes my outlook. Pocket shorts & envelope tee. A quiet Saturday at FolkArt Headquarters. Growing Up Sew Liberated: Giant PJs.